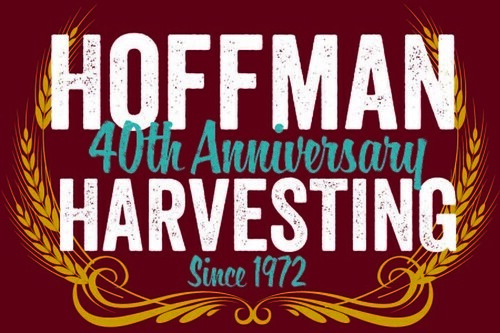 This year marks a special year for Hoffman Harvesting. It’s our 40th Anniversary! So we are celebrating this year with pride. By now, you would think we would be done having surprises in our profession and know what to expect; however, we were proved wrong once again. This year came earlier than we ever remember. I kind of feel like we dropped everything and left May 5- but that isn't entirely true. Last year, I will confess that was the case for me. I came home to a debacle. So I made sure that I started getting ready earlier this year. The proof is in how much is packed in my camper. The more time you have- the more you pile in it! It's that time of year again. Time to get the combines rolling and the crews to the field. The crews will be sharing their experiences as their custom crews move from Texas on north throughout the summer months. We encourage all of our fans to be as interactive as possible. Our correspondents love to see your feedback. Follow us on Twitter, “Like” us on Facebook, and catch our videos on YouTube. We also have a Flickr account where award-winning photos from years past are located and where new photos will be uploaded. While we anxiously await new sights of harvest enjoy a recap of some of the best photos of last harvest. Seven months ago my family and I left Elk City, Okla. to start our 2011 harvest season. It seems as if we should still be prepping for the long trip north, but instead I find myself trying to summarize the 2011 harvest and it is more difficult than I expected. I could say it was the best year ever, or that it was the worst - but I won't say either. This year was, shall I say, interesting. It was stuck in the middle. In August a few storms went through with very high winds and heavy rain. This type of weather flattens smaller fall crops that are in their growing stages, and unfortunately once flat always flat. Corn cannot just spring back up. We spent our corn harvest picking up corn that was on the ground. In my opinion, weather wasn't the only factor - and the variety may have played a roll. I say this after seeing a field where two varieties were planted in one field flopping from one pass to the next. One variety was completely flat, the other was not. I suppose the one variety was not able to withstand the fierce weather conditions. It has been super busy around the Misener Family household, and I can't believe how the time flies. Fall harvest has come and gone. The last time I updated you all we were kicking off fall harvest, but today I can officially say that the 2011 harvest season has come to a close. It's a bittersweet ending. I wanted to share a few fall harvest stories, since this harvest was not without difficulties. My combine caught fire on the last day of cutting when chaff build up met a hot hydraulic line. It was dry, and windy so even a small fire can be bad. We had been taking precautions to avoid fires by blowing the excess chaff from the machine, but it apparently wasn't enough. Dan, Joel, Lee and I fought the fire as best we could and emptied all the extinguishers we had, but it wasn't enough. The 40 mile per hour wind helped this fire get out of control fast. The fire department did get called and while we waited for them we fought the fire with one shovel and our feet. Fall harvest has started for the Misener family! We are on day three of cutting and the soybeans are looking good. We do see green stalks here and there, but we're running through the acres nicely. My Aunt Sonja and cousin Lee have joined us to help out. Sonja is running one of our combines, and has in the past. Lee was here for a couple days before going back and will come back next week when he can get off work. We really do appreciate all their hard work, and of course we love spending time with them. Here's a few photos from our last three days. The first field of beans in 2011. 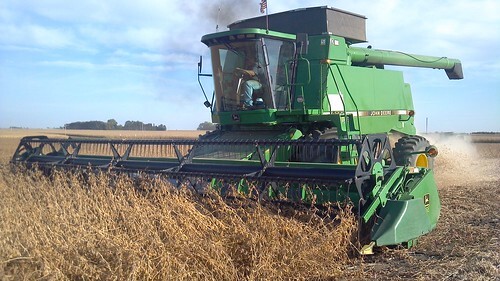 Dan is setting the combine to soybeans. The combine has a particular setting that is different from wheat because the seeds are different sizes. Finding those setting can be a challenge. We've been staying right on our farmer's place in Rock Rapids. It's in the country and we're parked right next to fields of corn and soybeans. These particular fields aren't what we'll be harvesting, but it will give you an idea how close harvest is getting. It's likely we'll be done with our soybean harvest before we get to the corn. Dan thinks we should be able to harvest at least by the end of the week, but I think we'll be testing as early as tomorrow. We are crossing out fingers and hope that we will be harvesting soon and that it will be just as good as last year. Let's just hope the weather stays nice. Fall harvest will be complete before we know it.